I am in Kolkata after 8 long years in Christmas and Pasta enjoyed the “Borodin” with her extended family for the first time. 2015 was a very special Christmas to me! Though I have made several cakes when I was I Gurgaon during Christmas but for the first time, I have received many customized Cake, Cookie and chocolate order in Kolkata. I somehow am managing by baking midnight after office core and spending time with my little baby. This year I have made one of my favorite cookies as Christmas gift in bulk which is nothing but the Eggless Jam filled Butter Cookies. The typical jammie inside and melting in mouth butter cookies! I have already gifted this to my near and dear ones and everybody including my little one is happy with it. 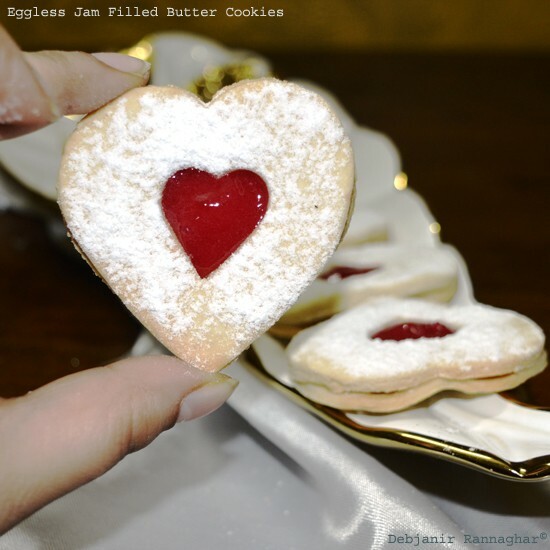 On this thought, I have decided to share the recipe of Eggless Jam filled Butter Cookies with my readers. Eggless Jam filled Butter Cookies look awesome and taste amazing. These cookies are quite popular in India and I bake those quite often for my family. To make these cookies we need a typical butter cookie dough and Jam to fill the cookies. I have used store bought mix fruit Jam to fill my cookies. Though any flavor can be used however red color jam gives a perfect look to these cookies. I prefer to prepare Eggless Jam filled Butter Cookies with a base of shortbread cookies and don’t like puffed cookies to use in this. 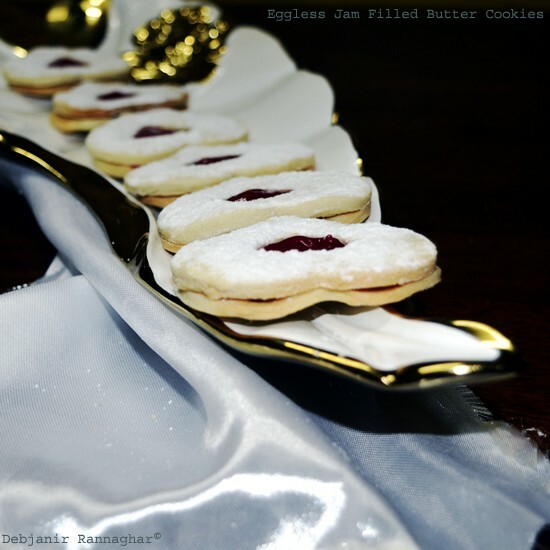 Beautiful looking melting in mouth Eggless Jam filled Butter cookies are really easy to prepare and perfect to gift in any occasion! Take All Purpose Flour in a bowl and add baking powder to it and mix using a whisk. Now sift flour 2-3 times and keep it aside. In a bowl take soft butter (butter has to be at room temperature) and using a hand blender or manual whisk cream the butter. It took me ½ minute at medium speed to cream the butter. Add Powdered Sugar to the creamed butter and using the blender mix those thoroughly till sugar mixes completely. Add milk to this mixture and mix properly. Now add Flour in batches to the wet mixture and mix using your hand until it turned into a breadcrumb-like a mixture. Do not overmix or knead. Now shape the mixture to form a dough and cover it with a cling film and refrigerate for 1 hour. 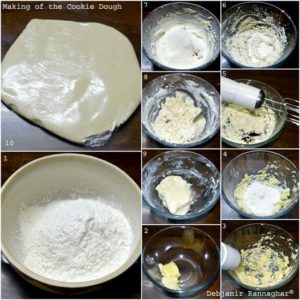 Take the chilled dough out of the fridge to make cookies. Place the dough over the flour and using a rolling pin roll it out into a 3” thick dish as shown in the picture. Now cut cookies using a cookie cutter. I have used a heart-shaped cookie cutter to shape my cookies. 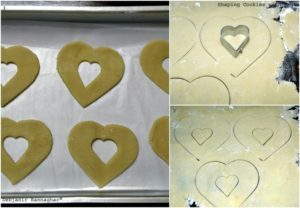 Using a big size heart shaped cookie cutter cut the cookies. Take a smaller size cookie cutter and cut out from the middle of half of the cookies to make a hole inside. 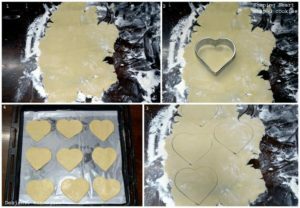 I have used a smaller heart-shaped cookie cutter to make the hole inside half of the cookies. Place a piece of the butter paper on a baking tray and place the cookies and refrigerate for 10 minutes. Pre-heat the oven of 10 minutes at 180 degrees C.
Bake cookies in 180-degree c for 10-12 minutes or till the base turned little golden. It took me 10 minutes to bake the cookies. Take cookies out of the oven and cool on a wire rack. Separate cookies with the hole and sprinkle icing sugar over those as shown in the picture. Now take Jam in a Cup and using a spoon or form mix it until the jam smoothens completely. Fill a piping bag with the smoothen jam and cut the bag to fill cookies. Place a cookie without a hole and spread some jam in the middle and place a cookie with a hole in the jam. Now pour some more jam in the middle to plump it. After filling all the cookies bake those in the oven for 1 minute. This step is optional but helps to give a glaze to the jam and to melt it properly. 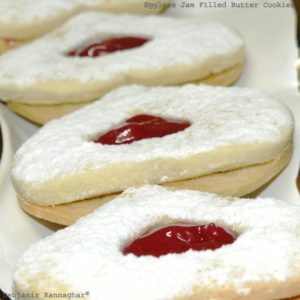 Jam filled Butter cookies can be stored in air tight container for 7-10 days. I have used two heart-shaped cutters to shape cookies. Different types of the cutter can be used as per preference. 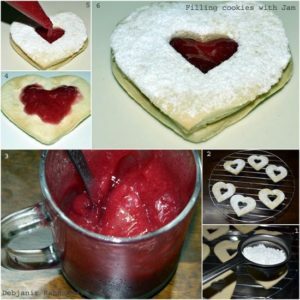 If smaller cutter not available, a small hole can be made using a knife to fill the cookies with jam. I have used red colored mix fruit jam; other flavors can be used as per preference.